Yahoo has announced it is entering the ‘Digital newsstand’ bunsiness with an app called Livestand, which is due to launch on iPad and Android tablets soon. 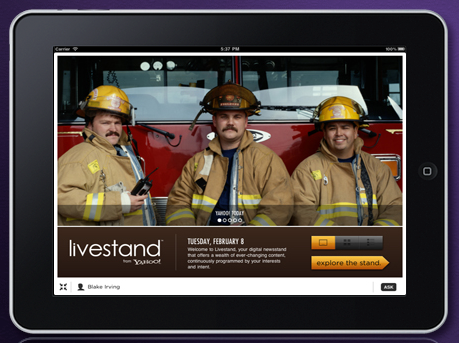 Livestand is a digital newsstand that’s always fresh and effortlessly personalized. Sit back and enjoy the news, entertainment, and local information you love, right on your tablet. The more you use it, the more it gets to know you. According to MocoNews, the project has been in development for a year and promises to offer more than just magazines in digitised form. Rich media and interactivity beyond merely commenting are both features being discussed. 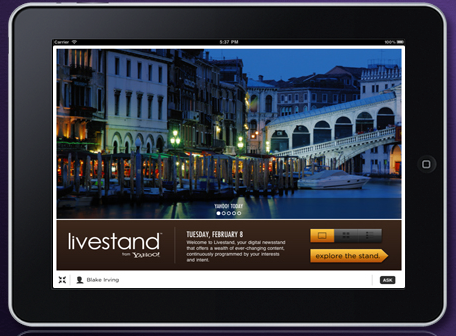 Yahoo will offer Livestand as a portal for existing publishers to offer their magazines in digital form. Interestingly, in addition to the large publishers that you might expect, Yahoo will also be encouraging small, independent publishers to upload content to the platform. The approach to personalisation is intriguing, with customisation based on your interests, your location and even the time of day. By announcing this now, Yahoo is heading off Google, said to be planning its own digital news stand offering in the near future. There’s no release date for Livestand as yet, but the platform’s website says it’s coming soon. Yahoo also offers a Facebook page, which will keep you updated if you’re interested in learning more.